Our oceans, seas, rivers and lakes are home to a large percentage of the animal species of earth. Many mammals have adapted to life in the water. Even those that never leave it still have lungs to breath oxygen and give birth to live young. Most of us know that whales and dolphins are aquatic mammals, living exclusively in the ocean, but there are semi-aquatic mammals, like seals, sealions, manatee and walrus, that live both in the sea and on the land. Among them, with a classification of its own, is one of earth’s largest carnivores: the polar bear. The scientific name for the polar bear is ursus maritimus, or marine bear. Polar bears are uniquely adapted for life in the sea. Their front feet are large, flat and oar-like and they have long necks and narrow skulls that give them a streamlined shape. With these advantages, the polar bear is a powerful endurance swimmer. Individuals have been seen in open Arctic waters as far as 200 miles from any land. Only the Kodiak bears of Southern Alaska can rival the Polar bear for size. Polar bear males weigh 550-1700 lbs (250-771 kg) and females 200-700 lbs (91-318 kg). The polar bear will gain a height of 8 to 10 feet (2.4 - 3m). To support their enormous size, such large animals must constantly hunt. They will travel great distances in search of prey, feeding largely on ringed seals and, to a lesser extent, on bearded seals. Under some conditions, they have been known to eat walrus, birds, vegetation, kelp, and even the carcasses of beluga and bowhead whales. Polar bears don't need to drink water. Their prey provides them with all the liquid they need. Polar bear cubs are 12 to 14 inches long at birth and weigh around one pound. They will nurse until they are about 20-30 pounds before emerging from the den with their mother in March or April. Polar bear populations are distributed in Artic regions throughout Alaska, Canada, Russia, Greenland and Norway. They must have pack ice to survive and can travel thousands of miles over the course of a year, following the advance and retreat of sea ice. Seal populations are abundant on pack ice, where currents and wind interact with the ice, continually melting and refreezing the edges, making it accessible to both predator and prey. 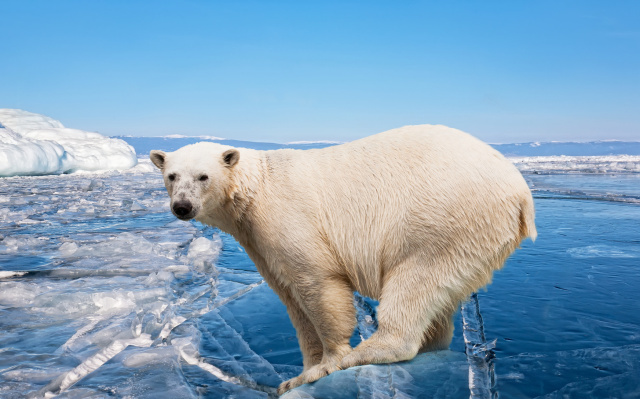 Older, stable pack ice is essential to the polar bear’s continued existence. It is where polar bears hunt, mate and den. Pregnant females make dens in the soft deep snows of the ice. They will give birth in these dens and the snow will insulate both mother and cubs over the harsh Arctic winter. Without a stable ice pack to accumulate sufficient snow, there can be no dens. The ice is also the seal’s habitat. Polar bears are strong swimmers, but they are not adept at catching seals in open water. The ice is necessary for successful hunts, where the bears stalk the seals using their breathing holes. Changes in the conditions of the ice have forced seals to move and give birth in different areas, making it more difficult for the polar bears to find and feed on them. Without ready and plentiful food, pregnant female polar bears cannot build the fat reserves they need to survive a denning period. With shrinking ice and inaccessibility to prey, polar bears could be extinct by 2050. Their habitat is melting away. When animals lose their natural habitat they will seek other means to secure food. Just as black bears will come into towns and communities in search of food, polar bears, attracted by garbage or animal carcasses, will enter areas of human population. When they do so, they can be killed. Although it is illegal to kill a polar bear, human caused mortality still remains a factor in the decline of this endangered animal. To help save the polar bear, we must support strengthening of the Endangered Species Act and include the polar bears’ prey base, suspend new Arctic gas and oil development until the bear population and their sea-ice habitat are fully protected and eliminate all trophy hunting throughout the Artic. Laws against poaching must be strictly enforced and programs implemented that offer rewards for information leading to their conviction.